Most parents have at least two or even three car seats stored away. They have the rear facing infant seat, a front facing toddler seat, and finally, the big kid seat. But, with the convertible car seat, you have a seat that takes your kids from birth to big kid stage. The convertible car seat converts from rear-facing seat to forward-facing toddler seat for kids as large as 30-40 pounds. Some higher end convertible seats even have an extra booster seat stage. So, what is the top rated convertible car seat? Well, it all depends on your needs and what you’re looking for. Our carefully picked list will help you choose the best convertible car seat. 14 Can I Start with a Convertible Car Seat? 16 What is the Safest Seat in a Car for a Baby? 17 What Makes a Car Seat Safe? 18 When Should my Baby be in a Convertible Car Seat? Having an all-in-one seat that is rear-facing, forward facing, and booster, all in a single unit is some parents dream. We’ve all been there, sucked in by the marketing line of “the only car seat you need.” But then we get the seat home and end up replacing it within months. So, when it comes to reviewing all-in-one car seats, we become a bit skeptical. While there are many seats available that say they are an all-in-one, they usually lack one or more features. If these all-in-one seats lack what you need for a forever car seat, then what’s the point of buying one? Luckily for parents everywhere, we found a true, forever all-in-one car seat. The Graco 4ever All-in-One does it all. The convertible car seat faces rear and forward and turns into a backless or high-back booster seat. But does this seat really do it all? Let’s dig a little deeper and see if the seat does everything it claims and if it does it well. 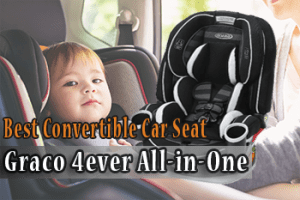 A good quality all-in-one convertible car seat has all the functions and features needed for your child. The seat should adapt to your child as they grow, from infancy until they’re out of the seat. For a seat that grows with your child, you need one with a great design that’s easy to use. A top-quality convertible car seat like the 4ever adapts to your growing child. The 4Ever also guarantees your child’s comfort and safe while giving you peace of mind. The Graco 4ever All in One design is stylish and elegant yet simplistic and is the perfect choice for all family types. This seat looks plain but has a high-tech design that easily adapts to all the stages of a child’s life. Whether you’re taking long road trips or a quick ride to the store, this seat easily adapts. With the Graco 4ever, everything is either adjustable or removable. You also get two removable cup holders for feeding on the go. This feature comes in especially handy for older children that are constantly hungry. The Graco 4ever has great maneuverability for switching up the seating comfort for your child. Just a few simple adjustments and you make your child more comfortable without risking their safety. Easy to remove cushions adapt the seat for larger or smaller children or children with special medical needs. The 4ever seat is one of the easiest convertible car seats to install, regardless of the seat mode you’re using. The only car you may have issues with fitting the 4ever in is a compact sports car with little bucket space. All the belt paths are color-coded and labeled. When you first install the seat, follow the instruction manual. After the initial installation, with the easy coding system, you should be able to handle installation on your own. The seat comes with latch and hook connectors, letting you choose the right connection method for your vehicle. There are other well-known safety features included like a latching system for anchoring the seat to your car. Many cars use this type of anchoring system, and it’s quick and easy to secure the car seat. Second to safety when choosing a convertible car seat is your child’s comfort. A stress-free ride comes from the child being comfortable. While the 4ever seat isn’t uncomfortable, there are convertible seats with more comfort than the 4ever All-in-One. You lose the most comfort in the rear facing mode. Even with three reclining options, you don’t have a personalized fit like other newborn and infant seats. If you don’t use the seat for extremely long trips, this isn’t an issue. If you do make longer commutes, you may want to find a more comfortable, temporary solution. For the most part, children won’t complain about using this car seat. For safety, functionality, and maneuverability, the Graco 4ever is our best convertible car seat. The Britax USA Advocate ClickTight convertible car seat has every feature you’ll ever need. Released in 2015, this premium model has the most bells and whistles of any other car seat in its class. This seat has a substantial price tag, but you get more bang for your buck than other convertible car seats. If you need a seat that grows with your child, the Advocate has an impressive age range and weight limit. 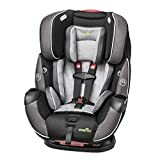 The rear-facing position safely holds children from five to forty pounds, and front-facing allows twenty to sixty-five pounds. Such a large capacity rear-facing position holds your baby in the safest travel position for as long as possible. The Britax ClickTight system has a design that makes installing the convertible car seat simple and straightforward. Britax makes sure their car seats install safely and securely regardless of who is attempting the installation. Just turn the ClickTight release to the open position, and put the seat belt through the seat’s lower rear-facing slots. Finish by connecting the seat belt and clicking the ClickTight closed. Yes, it’s that simple. When safely seating a rear-facing toddler, parent’s biggest concern is about growing legs and comfortable seating. 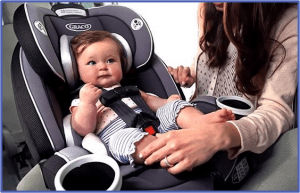 Graco answers these concerns with their Extend2Fit convertible car seat. Unique engineering design gives the Extend2Fit a slide out tray for accommodating the growing legs of a rear facing child. Even with supplying legroom for the growing child, the Extend 2Fit still maintains good legroom for a front seat passenger. The Extend2Fit is designed for babies and children 4 to 65 pounds and includes a head support and body pillow. Use the body support with smaller babies in the rear-facing position and remove when forward facing. The soft puffy pillow fits most head sizes and is removable when desired. This car seat is amazing with its easy install and 50-pound rear-facing weight limit all for a good price. Fan favorite dual cupholders, easy adjusting harnesses, a revolutionary extender and fuss-free pockets make this seat spectacular. If you can’t stretch your budget for one of the costlier convertible car seat options, the Extend2Fit might be the answer. The extension tray allows you rear-face your child for a longer time than other low-priced models. This 3-in-1 car seat by Dorel gets top ratings for installation, fit, and practicality. With a no-rethread 5-position harness and protective head wings, the user-friendly Grow and Go is made for the growing child. The convertible Grow and Go takes your children from rear-facing through early grade school. The Grow and Go beats out other market competitors with its functionality at every stage. While some car seats swallow a newborn, or crunch a toddler, the Grow and Go delivers comfort in all stages. The cushioning is incredible, and the cozy material covering the pads and straps pleases any child. If you find your seat a little stained after a long road trip, you can remove and wash the seat cover. This seat is fairly large for accommodating birth to toddler. However, most convertible seats run on the larger side. While this seat is big in stature, it’s a lighter weight than most at only about 18 pounds. It’s a great traveling seat that gives your child comfort without skimping on safety. An easy to use LATCH system makes an easy task of using this car seat in different vehicles. There’s a slight learning curve when feeding the LATCH system, but it’s not so difficult that you can’t master it. If you ever find yourself stuck, Safety 1st has an amazing customer service department willing to help. You can find the Safety 1st line of car seats at most department stores. The Go and Grow has an affordable price and is a great value for the money. Chicco manufactures one of the most well-loved car seats on the market, the Chicco KeyFit. When it comes to the KeyFit, the NextFit has some high standards to meet. But, NextFit holds its own when it comes to delivery some great features. Any seat wearing the Chicco name has high expectations when it comes to quality, function, and safety. Solidly built, the Next Fit delivers extra safety and comfort with deep sides and headwings. We have to say, Chicco delivered with the NextFit convertible. This next generation in the convertible lineup exceeds all expectations for its easy installation and ease of use. Chicco’s SuperCinch system makes getting a rock-solid installation in under a minute, easy for everyone from parents to grandparents. The harness adjuster tightens the seat easily and evenly with a firm tug of the adjuster strap. If you prefer using a seatbelt install, belt threading is simple. For a shoulder/lap belt, simply tighten the lap portion and close the lock off. Super quick and easy. The NextFit delivers a good fit for most children. A deep seat gives your child a good amount of leg room. While the seat’s not overly roomy, it does provide a comfortable fit for long and lanky toddlers. The shoulder room is good, and the headwings protect without blocking your child’s view. NextFit installs in a wide variety of different vehicles, and the seat has a good amount of rear-facing leg room. If you want a car seat with great safety features and will last for a long time, try the NextFit. If you’re looking for the best convertible car seat weight range for a child’s growth stages, the Symphony is it. Evenflo Symphony has one of the best weight ranges of any convertible car seat on the market. The Evenflo Symphony Elite accommodates children from 5 pounds up to 110 pounds. As with any other car seat with a large weight range, you must change seating positions at different weight levels. The rear-facing position handles babies from 5 to 40 pounds or 19 to 37 inches tall. Switching to the front-facing mode lets you carry babies from 22 pounds to 65 pounds or 28 to 50 inches tall. Changing the Elite to booster mode and the weight range is 40 to 110 pounds or 43.3 to 57 inches. With the Elite your child can use the booster mode until they are ready to move to the seatbelt stage. The SureLATCH connectors work well for getting the safe level tightness needed for an installation of under a one-inch movement. However, if getting a secure installation is difficult, you can easily switch to the seatbelt connection system. Seatbelts work just as well, but without having to deal with weight limits. Included with the convertible car seat is a no-rethread harness for easy height adjustment and setting while your child grows. A front adjuster lets you loosen or tighten the harness straps with little effort. In the Symphony base, you get three reclining positions You get fully reclined, semi-reclined, and fully upright. When your child reaches forty pounds, you will switch to the seatbelt installation and use the upright position. The Graco Nautilus 65 is a front-facing only seat that adapts as your child grows. With a weight limit range of 20 to 120 pounds, this convertible car seat is not made for holding newborns. The Nautilus starts as a harness booster for weights of 22 to 65 pounds and 27 to 49 inches tall. A Simply Safe Adjust 5-point harness system secures your child and adjusts as your child grows without rethreading. This convertible car seat offers your child extra comfort with three positions of recline. A one-handed adjustable headrest lets you easily reposition your child for staying comfortable on even long car trips. When your child’s weight gets above thirty pounds, it’s time to switch the car seat to a high-back booster seat. The booster seat holds your child until they weigh 120 pounds or reaches 57 inches in height. You can switch the Nautilus to a backless booster seat when your child weighs 40 to 100 pounds. If using the seat as a backless, there is no harness or back support. The three seat positions mean there’s no need for adjusting the seat when the child reaches the weight and height minimums. With the 5-point harness system, you can keep your child harnessed until they reach 65 pounds. The American Academy of Pediatrics recommends keeping children harnessed as long as possible. The Graco Nautilus 65 gives you a longer harnessing capability. When it comes to safety, the Nautilus delivers with a steel-reinforced frame for durability and strength. A layer of thick EPS foam makes the Nautilus energy absorbent, and the seat is crash and side-impact tested. These outstanding features exceed the rigorous US safety standards. The Graco Nautilus 3-in-1 is a great choice for parents wanting a car seat they can use for several years. The Primo Viaggio is Peg Perego’s break-in model to the convertible car seat market, and it’s a pretty impressive seat. With quality fabrics, deluxe LATCH straps, and thick webbing and harness, the Viaggio is top-of-the-line. The Viaggio has rear-facing from 5 to 45 pounds then forward faces at 22 to 65 pounds and under 49-inches. A 5-point harness supports a child weight of 5 to 65 pounds. The system means heavier children stay in the seat longer before moving to a booster or higher weight limit seat. Breathable Fresco Jersey fabric makes the Viaggio easy to clean and good at absorbing moisture. The material makes this Italian made seat standout in looks and craftsmanship. The Primo Viaggio, available in several colors, is one of the best-looking car seats on the market. The top selling point of the Primo Viaggio is the multiple built-in safety features. While there are not any new safety innovations, the Viaggio does have features far beyond any offered in lower cost seats. A steel plate located on the seat back helps support the spine and head during an impact. Generous side impact protection or SIP bolsters made of EPS foam adjust to the child’s height. A Peg Perego feature, called SAFE (Shock Absorbing Foam Element), located beneath the seat reduces crash forces during an impact. Finishing out the Viaggio’s features is the ease of installation. The Viaggio is incredibly easy to install using the LATCH connector system. In rear-facing, just slide each LATCH strap forward on the bar, click onto the vehicle anchor, and pull tight. You get a winner with the Peg Pergo Primo Viaggio. This convertible car seat has a solid build with quality materials and EPS foam. The Viaggio gives your child a comfortable ride with a bunch of safety features. 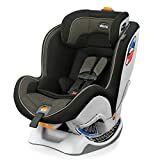 The Britax Roundabout G4.1 is the most basic, entry-level model car seat, from a top-rated company, available. However, just because it’s an entry level seat doesn’t mean its lacking in convenience, features, or safety. It doesn’t come loaded with features found on higher priced seats, but it’s a safe, dependable convertible car seat. The Roundabout is a popular choice for any budget-conscious parent. Height and weight limits are the biggest difference between the Britax Roundabout and the more expensive models like ClickTight seats. The Roundabout also has fewer harness slot height options and lacks the ClickTight belt installation system. However, the Roundabout still comes with a lot of the main safety features you find on the ClickTights. The Roundabout G4.1 keeps your child protected with SafeCell Impact Protection while Side Impact Protections absorbs a crash force. Each Roundabout model has an infant body pillow, harness strap covers, D-ring tether connector strap and a matching belly pad. All the features needed for a safe and comfortable ride. Another great feature of this entry-level car seat is its ease of installation. The Roundabout practically installs itself with the seat LATCH system. It’s super easy to get both a rear-facing and forward-facing snug install with the dual lower LATCH attachments. The easy install LATCH system makes the Roundabout a good candidate for grandparents or other caregivers needing an easy installation. While it’s not fancy, the Roundabout does cover all the needed bases for an extremely reasonable price. Innovative safety features give parents peace of mind. The seat not only cradles a child in comfort but protects them from an impact. Overall, the Britax Roundabout has a great design with the basic features parents need for safely transporting children. Rounding out our top ten list as the best budget convertible car seat is the Evenflo Tribute LX Saturn. While the Tribute LX isn’t one of the top rated convertible car seats, it is worthy of recognition. The least expensive on the review list, the Tribute LX Saturn sports a high score for ease of use and crash testing. This combination alone makes it a contender and a great budget-friendly seat with the two most desired qualities. For parents looking for a simple budget-friendly seat without sacrificing safety and easy use, the Tribute is the answer. Meeting all Federal safety standards, the Evenflo Tribute LX is side impact tested. The Tribute has a design at two times the Federal crash test standards for structural integrity. This compact and lightweight seat has two crotch positions, four shoulder harness positions, and up-front 5-point harness adjustment. The seat has a good weight and height range for your growing child. Rear-facing accommodates children weighing 4 to 40 pounds and 19 to 37 inches tall. The forward-facing position holds children 22 to 40 pounds and 28 to 40 inches tall. Weighing in at only nine pounds, the Evenflo Tribute is one of the lightest on the market. The light weight makes the Tribute a good seat for parents who frequently use Uber or taxis. However, if you’re still rear facing, this seat might be too difficult for efficient use. Rear-facing can make it difficult to get the seat strapped in since it doesn’t fit snuggly in all cars. This might be a deal breaker for parents that need to strap and unstrap quickly. But, if you need a second, lightweight option for unhurried travel situations, the Evenflo Tribute makes a good choice. It’s a well-known rule that unless you have a properly installed car seat, your newborn doesn’t leave the hospital. Because of this strictly enforced rule, most parents purchase an infant car seat before the baby arrives. However, in one short year, the baby has outgrown the infant seat, and it’s time for a convertible car seat. It’s also a time of confusion with parents sifting through all the car seat information to determine what they need. We’ve compiled some information for a less stressful car seat decision. 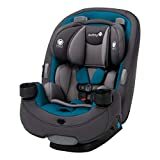 Information that hopefully helps you understand what to look for as you choose the best convertible car seat for your family. One short year ago, you bought a top of the line car seat. Now, you’re asking why you need to spend another huge amount of money on the same type gear. The car seat you have looks perfectly capable of holding your baby for possibly, another year. Each car seat has weight and height limits. These limits aren’t guidelines; they are hard and fast rules. If the maximum weight is 20 pounds and the baby weighs 21 pounds, he’s too heavy for the seat. Weight and height limits are put in place to protect your baby. The car seat manufacturer performed hundreds of hours of research and testing on their products to ensure a safe ride. Car crashes are the leading cause of injury and death of children. The manufacturer limits on these car seats are there to ensure your baby has the best possible chance of survival. So, following the manufacturer’s guidelines is the best way to protect your little one. Knowing when to upgrade from your infant seat is as easy as knowing the height and weight limits of the seat. When your baby outgrows one of the limits, not both, it’s time to change seats. A common mistake many parents make is only looking at the weight limit, but height is often the limit first reached. Look for height and weight limits listed in your user’s manual or contact the manufacturer for more information. Can I Start with a Convertible Car Seat? Today, there are several convertible car seats available made to accommodate children from infancy through toddler. These seats are perfectly safe and legal and can also take you through several years or even to the booster stage and beyond. If the seat is suitable for your child’s size, it’s perfectly acceptable to start with a convertible car seat. How hard is it to take the baby out of the car seat without waking them or does it matter? 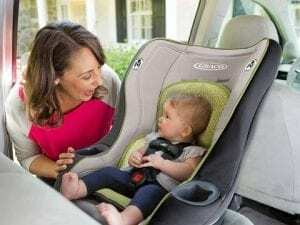 Are you planning to connect the car seat to the stroller? If so, convertible seats are too big to click onto the stroller. If these details aren’t a factor in your decision, then a convertible might be right for you. Now that you know you want a convertible car seat, what should you look for? The following is a list to help you get started in choosing the features most important for you and your baby. Crash test performances: Always choose a seat that meets or preferably exceeds all safety guidelines. A seat that fits the car: Car models differ so look for a seat compatible with your model. Comfort for baby: Make sure the seat you’re looking at gets high marks for child comfort. Fits the family lifestyle: Will you need a seat you can easily transfer to different cars? A seat that grows with your child: Do you need a seat that will see your child through as they grow? Or do you plan to use it for a younger child when the oldest outgrows it? Sitting three across: If you have more than one child or need to set three across in a seat, then you want a smaller profile convertible car seat. Look for car seats with slender bases. 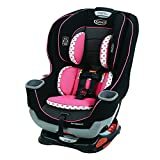 Easy installation: Ninety-five percent of all car seats get installed Regardless of who installs the seat, you want an easy to install with no errors. Brands like the Britax ClickTight have a design made to help with quick and easy installation and no errors. What is the Safest Seat in a Car for a Baby? This is one of the trickiest questions to answer. Which seat in the vehicle should the car seat be placed in? If you have a car, the best seat is the middle seat of the rear row. However, if you have a minivan, you will prefer the bucket seats. Likewise, if you have multiple children, it is recommended you place the youngest child in the middle rear seat. If your seats do not fit next to each other, you should place them on the outside seats. Remember, no children should be placed in the front seat. This is true even if the child is not in a car seat. What Makes a Car Seat Safe? The first thing that ensures your car seat will be safe for a child is how you secure it in the vehicle. Follow these instructions to keep your car seat conform with safety standards. Make sure the car seat base is placed according to the manual. 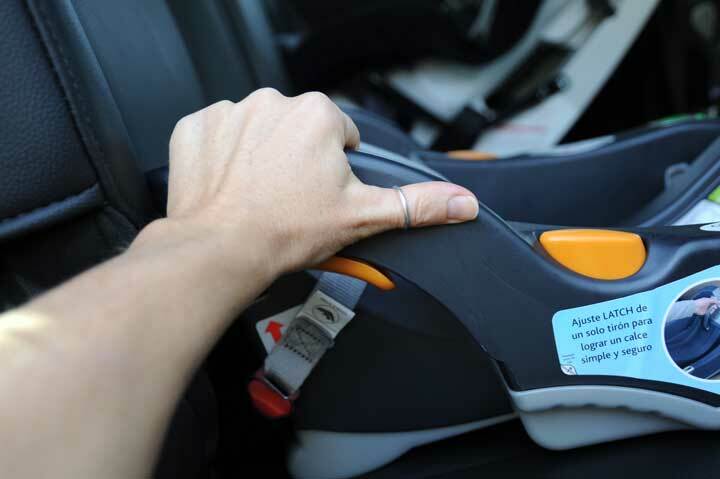 When tightening the car seat straps, ensure you push down on the base of the car seat. Make sure the part of the car seat which rests against the back of the seat cannot shift more than an inch. If you are still not confident, take your car seat to a fire station or hospital for a double check. Additionally, a car seat is considered safe by its design features. First, each adjustable piece of the car seat must be firmly locked in place. Second, the padding of the car seat should be cushioned, but not pillowy. If the car seat is too soft, there are risks of suffocation in case of an accident. A car seat should also curve around the child’s body, in a way that would protect that child from flying objects in a car. This curve would also keep your child protected in the unfortunate incident that the car seat would be ejected from the car. The last way that a car seat protects your child is through the seat belt. Make sure that your seat belt is attached with no more than a finger’s width underneath the seat belt. Additionally, make sure that the clip is positioned at armpit height, not over the stomach or sternum. When Should my Baby be in a Convertible Car Seat? Traditionally, babies should be kept in an infant seat as long as they fit the sizing for the seat. This means that you should check your child’s weight and height as they grow in the seat. Most children will grow out of their infant seat during their second year of life. When you transition them to a convertible car seat, make sure that you check the new weight limits and ensure the car seat is set up appropriately for your child’s age and size. After a summer of blueberry picking or beach visits, you find yourself with a messy car seat, and the burning question: how do I clean this thing? Below, you will find step-by-step instructions on how to clean your convertible car seat. First, find your owner’s manual and figure out how to remove the cover from the car seat. Once you have done this, you are ready to start cleaning! Next, shake off all the crumbs baby has left from those stressful cheerio filled car rides. Then, take a mild soap, your standard dish soap should do, and mix it with water. Then, gently scrub each affected area. No matter how bad the stain, do NOT use bleach on the stains. If a mild soap does not remove the stain, try a mixture of baking soda and water. This mixture should form a paste, which is gritty enough to remove most stains. Do NOT put the cover in the dryer. Let it hang dry completely, or the cover may shrink or lose its shape. If you still can’t get your cover clean, consider purchasing a replacement cover from your manufacturer. Another part of your car seat which will need to be cleaned is the buckle. Follow the instructions below to clean your car seat’s buckle. Completely remove the buckle from the car seat. To clean the buckle, only use water. If you use any detergents or other cleaning supplies, you may ruin the buckle. Do not submerge the buckle. If you submerge the buckle completely, it may not work properly. After you have scrubbed the buckle, you need to test that it still clicks into place. Check all of the connection points and test your buckle fully. If you are not thorough on this step, you run the risk of your child being in danger if he or she is in a car accident. Then, dry the buckle with a towel and reinstall your buckle! With these simple steps, you will have a car seat looking brand new for your little one! As soon as you bring the new convertible car seat home, test out how well it fits your vehicle’s backseat. Testing the seat right away guarantees you’ll have a new car seat installed before the baby arrives. If the car seat doesn’t fit your vehicle, you want enough time to exchange it before the delivery date. Do you have enough legroom for the front seat passenger? Are the harness straps easily adjustable in rear-facing? Do you feel confident in a proper installation? It’s important that you address these and any other issues that may arise which may mean a different car seat. Allow yourself enough time to practice all aspects of using your new car seat. Regardless of which seat you choose, you want a seat that ensures a safe, comfortable, and stress-free ride for everyone. Great article. I don’t have baby yet but your article helped me buy a gift for my sister in law. I wanted to find a convertible car seat for under $200 and now I have. Thanks! 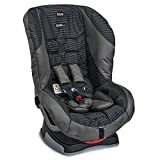 Great details about good car seat.The Safety 1st Grow Car seat will be a great one for any user. I like the fact that it can easily be converted to booster seat. I like the detailed information. Sometimes parents have hard times trying to figure out what to purchase. Especially when on budget which I am! I think the britax roundabout would be perfect for my son. Thanks for the great review! These convertible seats are awesome, much better than having to be stuck with a seat that has become too small. I was lucky to be able to trade mine with a friend, but I totally wish I had bought Chicco NextFit Matrix back at the day – it was not available then. It seems really nice. If I were to buy a new seat now, that would certainly be the one, specially considering that it is so easy to install, as you said. I remember my cousin with these convertible seats. We bought him an expensive one, but he doesn’t want to seat in it. He just cries and cries whenever we put him in it. Thanks for the options you provided. I’m actually 6 months pregnant and was researching ahead. The Graco seat looks reliable and a quality product. Graco 4ever All in One and Britax Advocate ClickTight are my top two choices for a convertible car seat. I think both are wonderful and quite amazing but I don’t know which to pick. Anyways, thanks for the review! I have a Chicco NextFit Matric, and you’re right. It is definitely heavy. Do they make lighter products? it’s really hard to buy a new car seat every time your kids are growing. Having a convertible car seat is honestly a LIFESAVER when you travel! We have a Graco car seat. It was a 2 in one for an infant/toddler. Some of the best cart seats… very safe. I’m very happy with my purchase. When I want to choose a convertible car seat, I would choose one that has comfortable cushioning first of all. I don’t want my child to be uncomfortable during the ride. I would also consider one that accommodates the growing needs of my children. This review was educative.